Over the last 2 years,when I was pregnant and then during Ananya’s first year..the room that we set up as Aadya’s room had turned into a big junkyard toy dump.It looked like a toy store just exploded in there.There were toys every where..I had put some toys in boxes and put them on the top-shelf in the cupboard,but there were always new toys-big toys,small toys,broken toys,happy meal toys,dolls,doll-houses,kitchens,kitchen sets,Cars,robots,soft toys,everything! 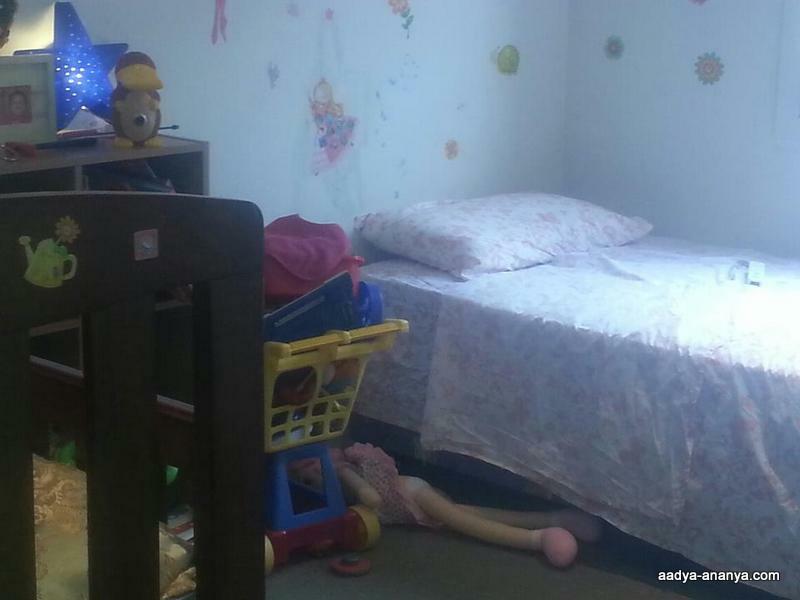 I couldn’t even bear to step inside that room..let alone ask her to sleep in there. Bit by bit,I kept sorting through toys,throwing some every few months,donating the good ones,saving some for Ananya.SD says,”yeah right!As if you are not going to buy toys for her!And I realise thats true..we do end up buying toys for her-the ones that she likes and not her sister’s hand-me-downs. I sorted through the toys yet again-threw out two big bags of broken toys,kept aside two baskets full of toys that I could sell or donate.And then gave the room a thorough clean,changed the position of the bed and moved Ananya’s crib in the room! 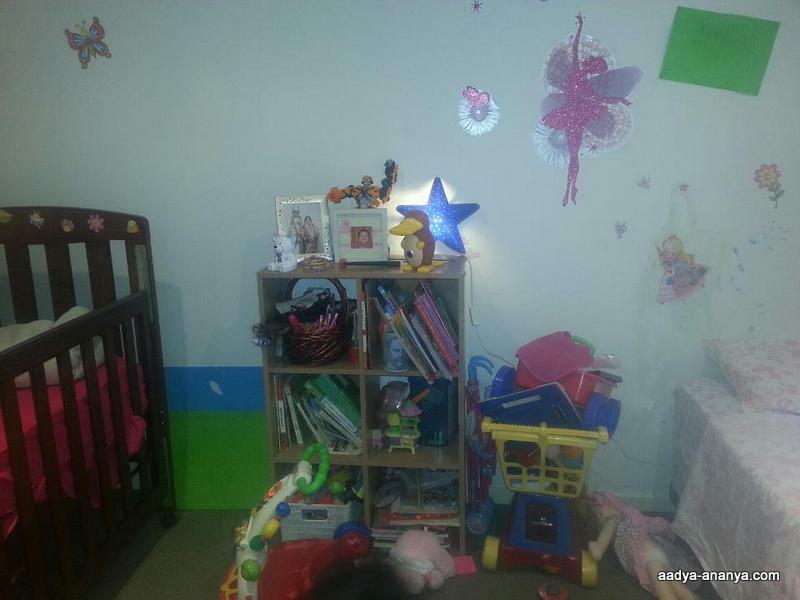 This is the bookshelf that holds their books,pretend food,dolls and cars.On the sides of the book shelf are -a shopping trolley that holds little toys that Ananya plays with And a doll crib that Aadya plays with.Like the wall decal? 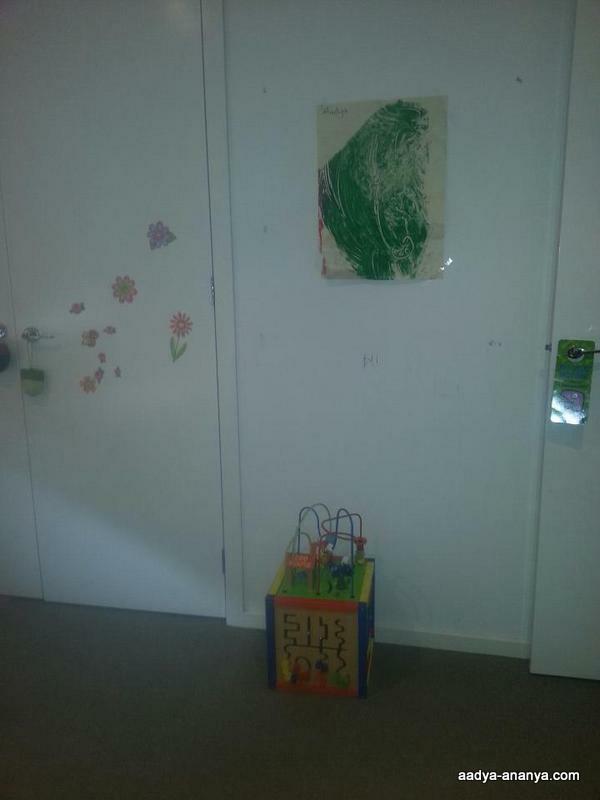 Lastly this is the wall by the door.The painting is from Aadya’s kinder artwork and that cube is my favorite toy for the kids.It was one of the first toys that we bought for Aadya when we first moved to Australia and it is now Ananya’s favorite toy.Today,Ananya suddenly disappeared somewhere in the house.When I found her,she was playing quietly with the cube.Love the colors on it! I want to move the trolley n the crib etc. in the cupboard,so that there is more space for them.That and add some small touches here and there..Like add a rug for instance and may be desk with storage space or may be a bed frame with storage/desk attached,but may be later..for now this will do. it is a million times better than my room for sure ..
Hahahaha!you are funny Bik!we have to see how long it lasts! Hey the room looks cool. Is there any decor on the roof too ? waw great outcome..even I have to do a make over for my daughter’s room, its kind of dumb yard now. Fingers crossed this stays like this for a few days. 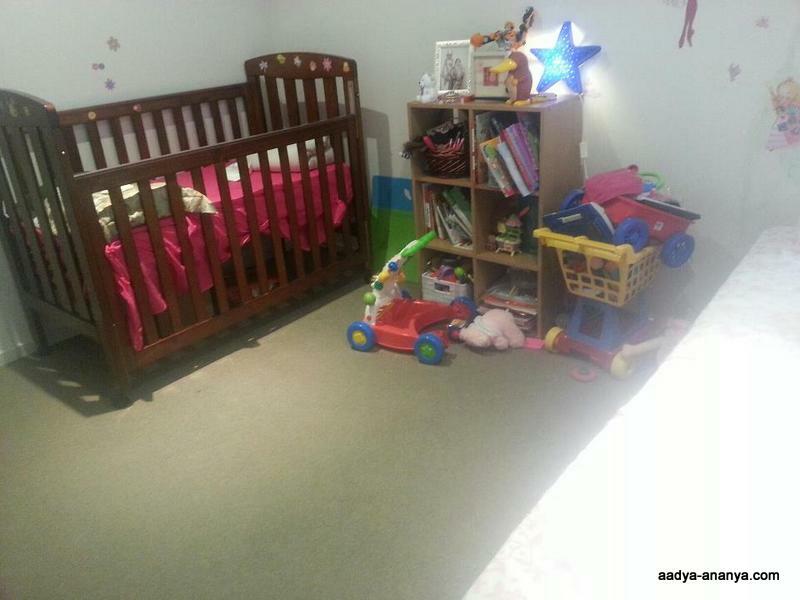 I would love to see pics,when you finish your little one’s room,LF!